When it comes to exfoliating and hydrating the skin, there’s nothing like a good, homemade scrub. Whether it’s for your face, lips, hands or entire body, you can whip it up quickly with things you have in the pantry. The base is usually sugar (white or brown), salt (Epsom or otherwise) or oatmeal, with the latter being the most gentle of the bunch. From there, you can just improvise with oils and fruit. 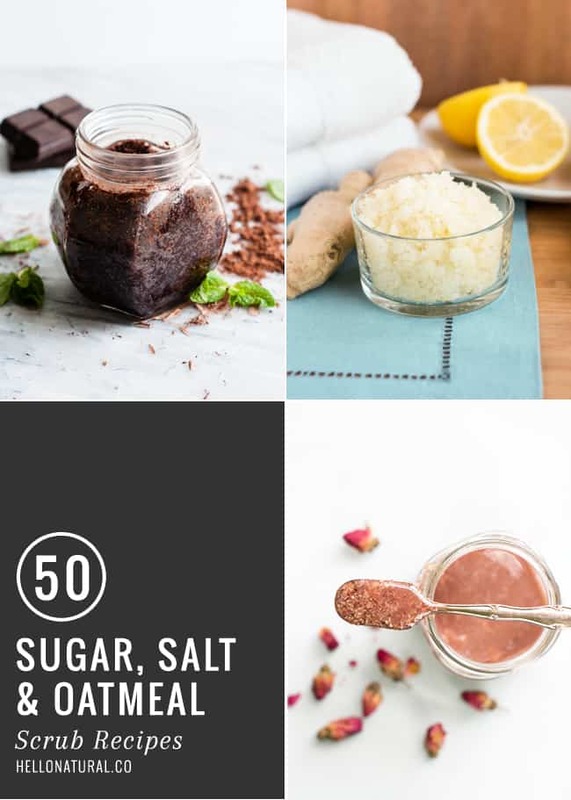 Try one of these 50 sugar, salt and oatmeal scrub recipes or make a big batch for holiday gifts – each one is guaranteed to pamper. 1. Apple cinnamon body scrub by Pretty Plain Janes, which smells like the most delicious apple pie. 2. 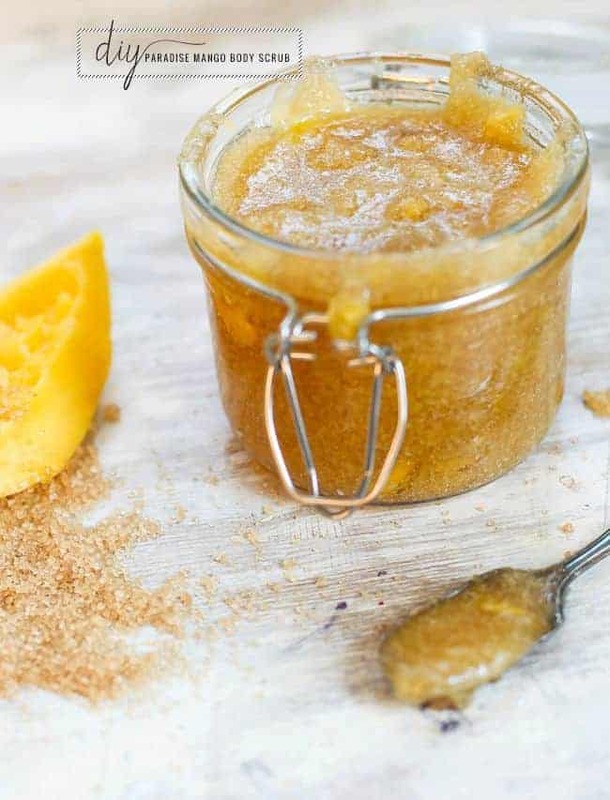 Navel orange vanilla raw sugar scrub by Daily Squeeze smoothens rough spots and softens the skin. 3. Whipped grapefruit mint sugar scrub by The Kitchen McCabe looks like a cupcake, but softens the skin like coconut oil. 4. Paradise mango DIY scrub by Hello Glow, a tropical addition to your bath routine. 5. Coffee honey body scrub by Alyssa & Carla will also reduce the appearance of cellulite. 6. Pumpkin spice facial scrub by Hello Glow, or as we like to call it, fall in a jar. 7. Marzipan body scrub by Kittenhood, which also happens to be edible. 8. Sweet grape body scrub by Savvy Naturalista has the nicest shade of lilac we’ve seen lately! 9. Green tea body scrub by Babbling ‘Bout Beauty, combing all the benefits of green tea with exfoliation and moisture. 10. Coconut milk sugar scrub by Hello Glow is hydrating and it keeps that smooth-skin feeling on for a while. 11. Coconut lime sugar scrub by Handmade Mood takes only a couple of minutes to make and it transports you into a different world. 12. Gingerbread scrub by Wallflower Girl, for in between holiday baking moments of relaxation. 13. Snow cone sugar scrub by The Gunny Sack looks (and smells) like a dream. A pastel, snow cone dream. 14. 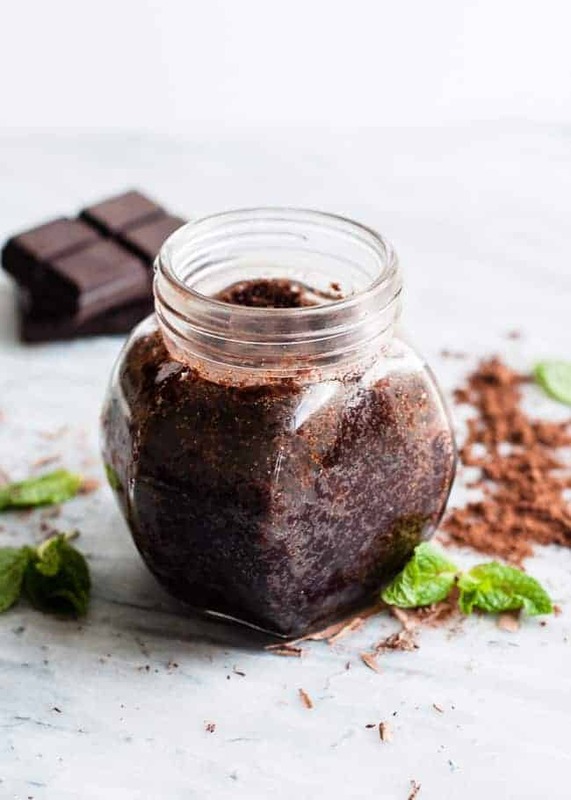 Mint chocolate sugar scrub by Hello Glow, a divine smell that helps with chocolate cravings. 15. Birthday cake sugar scrub by Kumquat is the type of scrub you want to use on your birthday (and any day, really). 16. Lemon poppy seeds sugar scrub by Sprinkle of Cinnamon doubles on the exfoliating properties with the aid of poppy seeds. 17. Homemade peppermint foot scrub by The Chic Site only has four ingredients, it’s refreshing and effective. 18. Aloe vera salt scrub by JJ Begonia is healing in addition to feeling great on the skin. 19. 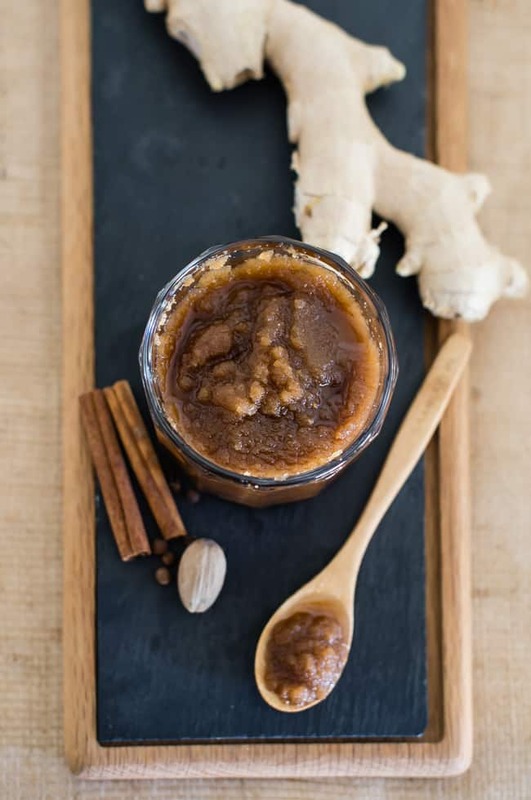 Orange cinnamon body scrub by Ma Nouvelle Mode, or all the benefits of winter in one product. 20. Himalayan pink salt scrub by Evermine is pretty-looking, but also therapeutic for your skin. 21. Citrus salt body scrub by Hello Glow is relaxing and immune boosting because of all the vitamin C in citrus. 22. Almond & floral body scrub by Lia Griffith is a calming scrub made with lavender and flower petals. 23. 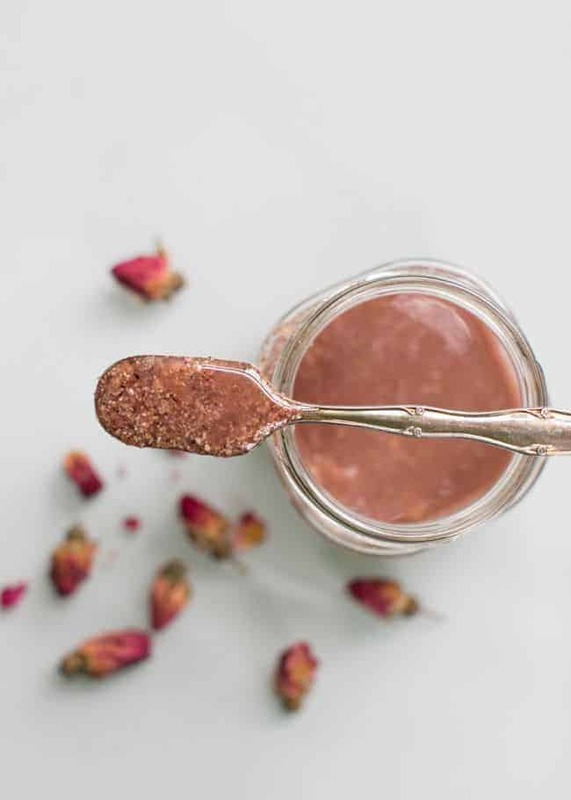 Rose body scrub by Oh So Pretty makes you feel smooth and smell amazing all day long. 24. Margarita body scrub by Hello Glow takes care of all those leftover limes and tequila. 25. 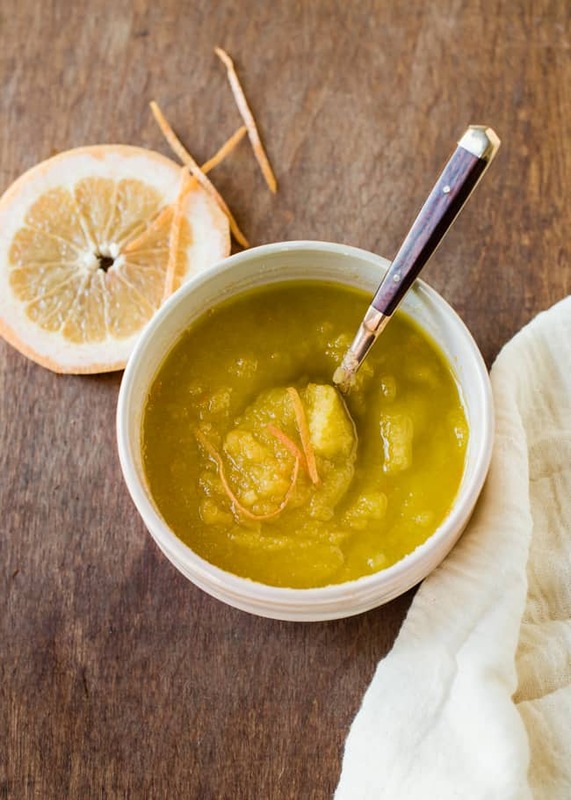 Citrus salt scrub by Offbeat + Inspired, made with your favorite essential oils and citrus. 26. Lime + ginger sea salt scrub by Nourish & Inspire Me, a spicy and invigorating option for weekend pampering. 27. Pina colada scrub by Go Make Me is made with read coconut, as well as coconut oil, lemon and Vitamin E.
28. 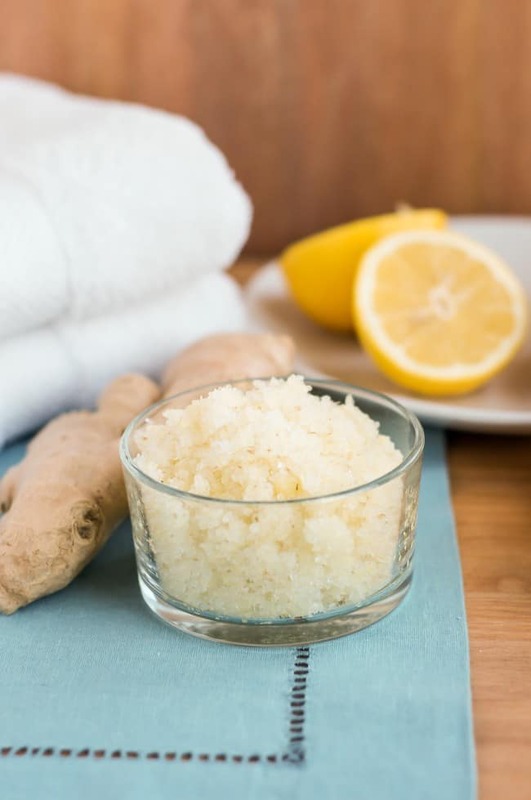 Ginger detox body scrub by Hello Glow, the perfect exfoliant before a detox bath. 29. Scented salt scrub by Mad in Crafts can be customized with different scents and printable labels to give away. 30. Mint lime salt scrub by Call Me Fudge is a truly refreshing morning shower experience. 31. Sea shower scrub by The Makeup Dummy is inspired by Lush’s Rub Rub Rub. 32. Gerenium pink sea salt scrub by Freutcake smells of rose, lychee and coconut oil. 33. Ultimate skin scrub by Mama Dweeb has all the right ingredients to be called “ultimate”. 34. Summer-ready coffee foot scrub by Hello Glow, for perfectly smooth and silky feet, at last. 35. Butternut squash scrub by JJ Begonia leaves your skin glowing and the cinnamon kills bacteria. 36. Pumpkin spice scrub by Alyssa Renee, which involves not only pumpkin puree, but also oatmeal and essential oils. 37. Oatmeal honey face scrub by Dabbles & Babbles is gentle on your face and it helps cleanse the skin deeper. 38. Coconut oatmeal scrub by A Pumpkin & A Princess is perfect for a girls’ night in! 39. Rose + chamomile facial scrub by Hello Glow, a gentle, everyday scrub made with rose petals and calming chamomile. 40. Oatmeal coconut cookie scrub by Smart School House feels like you’re eating cookies, without any guilt. 41. Oatmeal almond body scrub by Blissful Domesticity is great for sensitive skin and for winter skin care. 42. Oatmeal and honey scrub by Mommy Mentionables, made with both oatmeal and sugar, for extra exfoliation. 43. Cinnamon vanilla oatmeal body scrub by My Baking Addiction, one that’s really for all the baking addicts out there. 44. Oatmeal body scrub by Freebie Finding Mom come with free printable labels for gift giving. 45. Oatmeal cookie scrub by Chrissy, Inspired is simple and quick to make, keeping for up to 4 months. 46. Mango body scrub for sensitive skin by Hello Glow is rich in Vitamin A, which helps skin regenerate, and soothing honey. 47. Cinnamon scrub by Sifa’s Corner helps get rid of blackheads! 48. Oatmeal, yogurt and honey scrub by Real Beauty Spot is made especially for oily skin, deep cleaning the pores. 49. Face scrub for normal to oily skin by Blah Blah Magazine leaves your skin glowing even if it’s usually oily. Very useful beauty care tips. Will surely try it soon. I am a new subscriber. This weather kills my skin. I am going to try a few of these and see if they help.